Trenches are a general's best friend. "I have definitely lost," says Steel Division 2 game director Alexis Le Dressay. His prediction is lamentably accurate. The Soviet divisions overrun his bunkers and gun pits, blow up his tanks and chase his infantry out of their woodland hiding spots. Across the battlefield, columns of smoke mark the final resting places of countless vehicles from both sides. It's my first taste of the upcoming wargame's new Breakthrough mode, which pits a dug-in defender who controls most of the map against an invading army. The 5th Panzer division that Le Dressay selects for the battle packs a punch, but it's not the best defensive division, he tells me. They put up a valiant fight, though, spread across the 2km battlefield, on land and in the skies. More than a few Soviet units end up as smoldering wrecks as they push into Axis territory. I suspect that having an inquiring, chatty journalist asking questions is not conducive to managing a huge battle, but Eugen's also made improving the AI a priority. "We really wanted to the AI to be good," says Le Dressay. "A lot of players will start learning the game by playing the easy AI, so it's very important that it gives them a nice challenge, but a slow-paced challenge. Usually that's the difference between a good and a new player—the ability to deal with the pace of the game." The work continues, and it's one of the reasons Steel Division 2 is no longer launching in April. The new May release date means more time to work on the AI. For the turn-based campaign mode, which you can read more about in my first Steel Division 2 preview, new AI has been developed, while the real-time AI has had to adapt to fortifications and new tactics. Breakthrough is a good place to show off the new fortifications. The first Steel Division let infantry fortify buildings, which they can do again, but this time armies are also bolstered by trenches, gun pits, bunkers, barbed wire and other defensive toys that can be placed on the map during the pre-fight deployment phase. They're serious obstacles and capable of locking down key areas, but they're not insurmountable. The trenches, unexpectedly, prove to be the most effective. Le Dressay plonks a pair of them down on either side of a road which, once the real-time battle begins, a large group of Soviet troops and vehicles end up using. Infantry are more vulnerable in Steel Division 2 than its predecessor, where the hedgerows of Normandy gave them an advantage, but trenches give them incredible staying power, allowing them to hold the line and not get pinned down for a long time. And while they lack the firepower of a heavy tank, by halting the enemy, they make them a prime target for more powerful units. On the hill above the ducking soldiers, all that remains of the first wave are a bunch of burning vehicles. But more come, and while the trenches manage to keep the Soviets from spilling out of the forest to the north, in the east and west they break through and send men and tanks fleeing. The assault is slowed down, but it's not stopped. With all these new ways to potentially halt an advancing enemy, you might expect Steel Division 2 to be slower than its predecessor, but the opposite is true. Infantry and vehicles can move and shoot, and engagement distances are massive, so there should be fewer lulls in the action. Le Dressay says they're more in keeping with the historical engagement distances than the battles in its predecessor, and units start getting blown to smithereens pretty quickly. This is especially true in Breakthrough, as the defender's units can be placed almost anywhere on the map. After getting a bit of advice from Le Dressay, I challenge the AI to a duel myself, this time defending as the Soviets. It's a slightly newer build than the one Le Dressay showed me, and is similar to the one players in the closed beta will get access to today. Only one map is available, the one I've just seen, but there are 25 in the game. Most of them are finalised, there's still some work to do. "In this version of Steel Division we have a lot more maps," says Le Dressay. "We want to deliver a lot of maps, but some of the maps had problems in terms of graphics and took us a bit longer than expected." It's another reason for the delay. The maps will be playable in any configuration, he says, with different player numbers and modes. 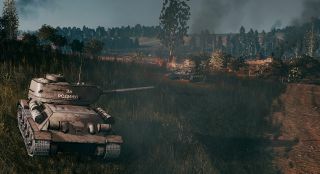 The big 10v10 games take place on maps designed for that scale of conflict, however, and will be hosted on Eugen's servers. Remembering how long they held off the attackers for before, I dig a lot of trenches. Comrade Trench, my unimaginative troops call me. I protect them with barbed wire, too, and hide bunkers and gun pits in prime ambush locations. Engagement distances might be longer, but there's still nothing better than getting the drop on an enemy as they drive by your troops, oblivious and potentially presenting their weak spot. Behind those trenches and bunkers, I build another line of defenses. And another. Oh yes, the turtler is here. There's a limit, as they cost requisition points and can only be placed during the deployment phase, but you can still really dig in. They're incredibly comforting, these fortifications. It's reassuring, knowing that when you drop one onto the map, that area is taken care of, at least for now. To fend off a proper push they need backup, but it still takes off some of the micromanagement strain. That area can fend for itself while you're dealing with planes getting shot out of the sky or those inexplicably sneaky German tanks who somehow found a chink in your armour. All of a sudden, the front line changes, pierced by tanks now slowly making their way towards objective areas. I send a recon plane in so I can get a bead on them, but it's shot down by their AA support, slamming into a field and exploding. Luckily I've still got a trick up my sleeve: the magic of radio. While I'm light on units in the area, I do have one lurking in a forest that's able to communicate with the rest of the army, most notably my devastating artillery. It's a special feature that only certain units have, and it allows artillery to share their vision. I move the unit slightly closer, and I can see a big blog of tanks and vehicles moving through the Belarusian countryside. They're sticking close together, which is lucky. They're a perfect target for my artillery. It's quite the sight, watching those rockets heading off to do their terrible work as they leave gargantuan, arching smoke trails in the sky. War might be a nasty business and turn Steel Division 2's battlefields into pockmarked killing fields full of detritus and ruined buildings, but it's still a remarkable visual treat. The level of detail borders on the absurd, especially when so much of the game is spent zoomed out, looking at an overview of the battle. It looks great at any distance, but it's only when you're on the ground with the troops and tanks that you can really appreciate the attention that's been lavished on each model and the striking terrain their duking it out on. The rockets hit their targets, or close enough to send the rest fleeing. Like its predecessor, confrontations often end in retreat rather than outright destruction, with morale playing just as important a role as armour. Their anti-air has been taken out, too, so I send in some of my airforce to finish them off. With this bit of luck, I've managed to keep the Axis from gaining too much ground and bought myself enough time to bring in the big guns. Finally, it's phase C. Not including deployment, battles are split into three phases, and when you construct a battlegroup, you also decide when you're going to bring in specific units. Some can be put in any phase, while other are exclusively late game. There are advantages to holding off, like being able get three tanks instead of just one. I have a lot of tanks coming up the road. With my new tanks, I decide to go on the offensive. Once they merge with the rest of my units, I push north and start getting into too many fights than I can really handle. Thankfully, my forces are bolstered by commanders. They're pricey units that can provide support by increasing the veterancy of units within range, dramatically improving their capabilities. It's enough. The battle ends a little abruptly, I think because I'd accumulated a lot of objective points, but importantly it ends with the Axis running away. The original Steel Division had defensive missions, but the addition of player fortifications and the new combat distances make holing up in an area and fighting for your life even more engaging. And with my beloved trenches, as well as the other defensive structures, there was just enough pressure off me so that I could get to grips with the game without constantly feeling on the back foot. An ally would help even more, as there are quite a few responsibilities that could be divvied up. Thankfully, Breathrough, and all the other modes, can be played cooperatively, so you can blame someone else when things go pear-shaped. Steel Division 2 is due out on May 2, and the closed beta starts today.